Plants in front of a house provide curb appeal and help blend the building's sharp corners into the landscape. Plants can also focus attention on the entrance, guiding the eye and guests toward it. Select trees, shrubs, perennials and ground cover plants that tolerate pollution from traffic and grow well in the existing conditions, such as full-sun or partial shade, and dry or moist soil. Plants should also reflect the home's style. Formal, clipped hedges suit traditional and modern homes, while borders full of flowering perennials enhance small cottages. Check your local community rules before selecting plants. Tall trees toward the front and side of a house provide a framing effect. 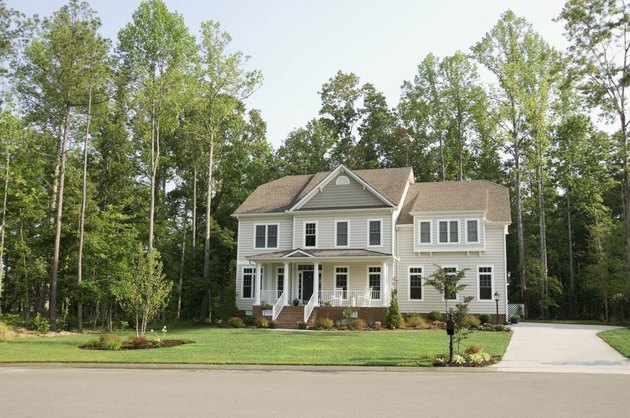 Trees add interest and height to shrub beds, and shade the front of a house. Magnolia "Butterflies" (Magnolia "Butterflies") grows 15 to 20 feet tall and 10 to 15 feet wide, and bears yellow, tuliplike flowers 4 to 5 inches across late winter through spring. Hardy in U.S. Department of Agriculture plant hardiness zones 5 through 9, and growing well in full sun and partial shade, "Butterflies" also features attractive dark green leaves until fall. Persian ironwood (Parrotia persica, USDA zones 4 through 8), which prefers full-sun sites, grows 20 to 40 feet tall and 20 to 30 feet wide. This deciduous tree offers colorful foliage throughout the growing season. New growth emerges reddish-purple in spring and matures to dark green in summer. In fall, leaves turn yellow, orange and red. Plant trees the same distance from the house as their height. Small groups of shrubs provide structure to landscaping in a front yard. Maidenhair tree "Chi-Chi" (Ginkgo biloba "Chi-Chi," USDA zones 3 through 8) features fan-shaped, leathery, rich green leaves that turn bright yellow in fall. Growing slowly to 4 to 5 feet tall and wide, "Chi-Chi" forms a dense, rounded shape. Japanese spirea "Gold Mound" (Spiraea japonica "Gold Mound"), which is hardy in USDA zones 4 through 8, is another compact, mounded shrub. Named for its foliage that emerges golden in spring and matures to gold-green, "Gold Mound" bears flattened clusters of small, pink, late-spring blooms, and grows 2 to 3 feet tall and 3 to 4 feet wide. Both "Chi-Chi" and "Gold Mound" thrive in full-sun sites. Plant shrubs in groups of odd numbers, such as three or five, for an informal effect. Flowering perennials growing near a house entrance draw the eye to the front door. Select two or three contrasting or complementary colors for a coordinated effect. Lenten rose (Helleborus orientalis) provides late winter and spring interest with its cup-shaped, nodding white, pink or light rose-purple blooms. Hardy in USDA zones 4 through 9, it grows best full or partial shade. Daylily "Happy Returns" (Hemerocallis "Happy Returns," USDA zones 3 through 9) offers ruffled, lemon-yellow flowers 3 1/2 inches wide from early summer through fall. Both perennials grow in 12 to 18 inches tall and wide, and grow best in full sun or partial shade. Ground cover unifies landscaping in the front of a house, linking separate planting areas. White stonecrop "Coral Carpet" (Sedum album "Coral Carpet") is named for salmon-orange spring foliage that matures to bright green and fades to reddish-bronze in winter. Hardy in USDA zones 3 through 9, "Coral Carpet" grows 3 to 6 inches tall and 6 to 9 inches wide. Creeping thyme "Pink Chintz" (Thymus serpyllum "Pink Chintz," USDA zones 5 through 8) grows 3 inches tall and 3 to 12 inches wide, and features woolly dark olive leaves and small, salmon-pink summer flowers. Both "Coral Carpet" and "Pink Chintz" grow best in full-sun sites.